For Christians, worship is the active expression of praise and thanks to God. This is because God is God, and we are not, and until we can not only admit that reality, but also let it have control of our lives, we will remain moving in a direction that takes us away from relationship with God. This is because the primary sin of humanity is trying to live as if we are the center of life, not God, and that we can live a holy and happy life without God. When we give God praise for the gifts He gives us (from life itself, to family, friends, wealth, etc. ), we begin the turn away from centering life around ourselves and our delusions of self-importance, and begin to recognize who God is, and how He calls us to live. When we thank God, we begin to turn to the only One who can truly enable us to be holy and make us happy. Jesus spoke about this when He said in Mark 12:29 that the most important ‘commandment’ in how we are to live is to “love the Lord with all your heart, and with all your soul, and with all your mind, and with all your strength.” The Bible, tells us that ‘loving’ someone is not just an emotion we feel, however, but everything we do in our relationship with a person. So, just as we would speak with, and spend time with, those persons we ‘love,’ so we need to speak with, and spend time with, God. Worship is one way we speak with God, and spend time with God. Many Christians see the basic pattern of worship displayed in Isaiah 6. In that chapter, Isaiah has a vision in which he is brought into the presence of God, and in God’s presence certain things happen. That pattern includes the ideas of hearing God call us into His presence, hearing God speak to us, bowing down before God in reverent acknowledgement (and confession) of how unlike God we are, hearing God forgive us and offer to empower us to live in relationship with Him, and then being sent forth into the world in His name to share His love with others. 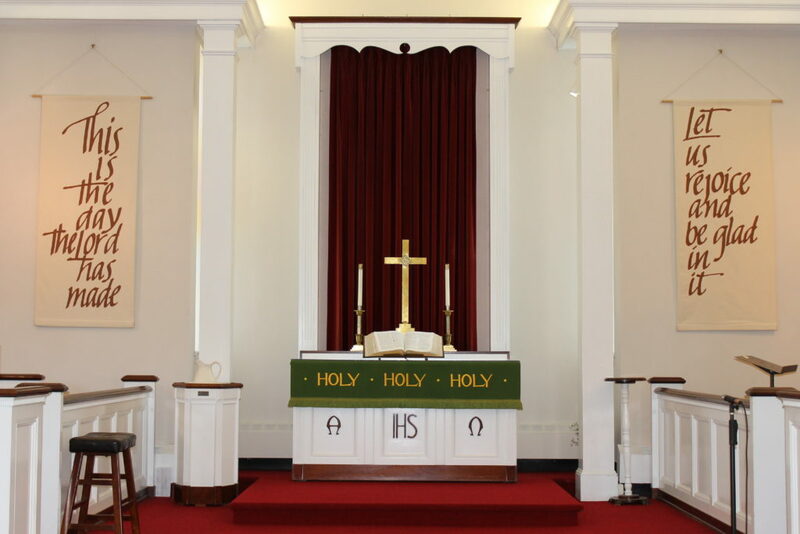 We have three worship services each Sunday morning. The 8:15 and 11 am services are traditional in style, and the 9:30 am service is contemporary. Contemporary Worship Services often include many of these same worship activities as a traditional service, but they are often done in a way that is not as liturgical, and more casual. More songs sung are also usually sung in a contemporary service than in a traditional service, and the songs are of a contemporary Christian music genre, rather than classic hymns. The words of the songs are also usually printed in a bulletin, or projected on a screen rather than being sung from a hymnal.